When our girls were young, we made several trips to Disney World. We stayed on the property and immersed ourselves in all things Disney. By the end of the trip, we would manage to talk ourselves into buying something that made perfect sense in the moment that we’d never wear outside, in the real world: rhinestone mouse ears, a beautiful linen shirt with a life-size Goofy profile on the back, etc. When I was in Bolivia, I purchased baby alpaca socks, one of the warmest varieties, for my dad to use when he goes hunting. He absolutely loved them, unlike the Loch Ness Monster figurine I bought him from a gift shop in Scotland – yes, bad move, not to mention he thought it was a dragon. 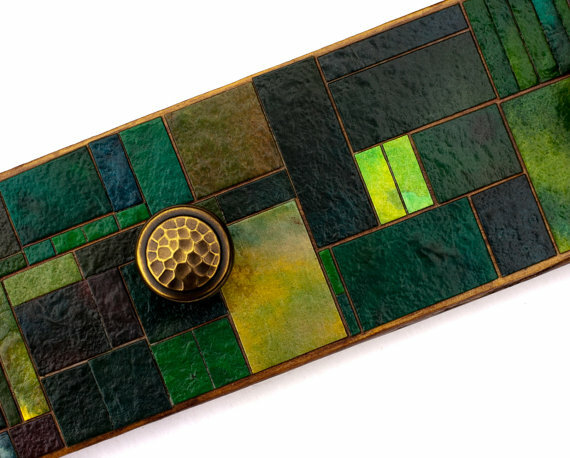 What makes a good souvenir? I've been reading some posts on The Kitchn this week, and they've been thought-provoking. Emily Ho likes to buy honey. 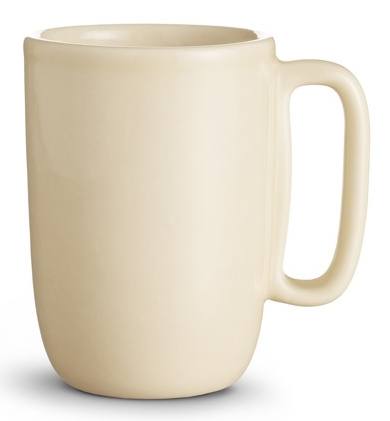 Emma Christensen cherishes the single Heath Ceramics mug she bought in Sausalito. Throughout the years I have used these bowls with much delight. They make excellent cereal, yogurt, and yes, café au lait bowls. They also make good soup bowls and excellent prep bowls. I use them several times a week and wash them carefully by hand. I get a lot of pleasure when I reach for them and when I do, I am always reminded of Paris and the beautiful, magical week I spent there. And over on The Guardian, fashion designer Jimmy Choo shares his favorite souvenir: a tie. Whenever I travel to Malaysia, my home country and the place where I spend my holidays, I buy batik. ... I love the batik tie I bought during my last trip. The fine quality of the batik and the elegant print make it a perfect tie to wear with a black suit and a white shirt. As I read these stories, I see some common themes. 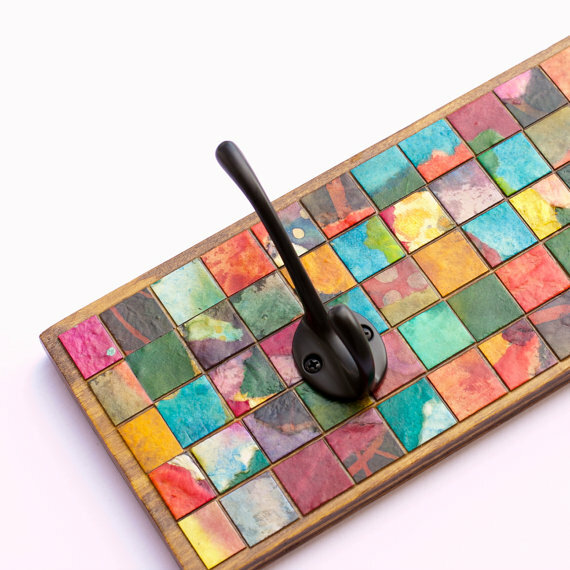 Many of the best souvenirs are intensely personal, and they don't scream "souvenir." Instead, they are things that get used — with each use bringing back good memories. Of course, other types of souvenirs appeal to people, too. Some collect refrigerator magnets, thimbles, Christmas ornaments, etc. Local artwork to decorate your home or office can also be wonderful; I've bought that type of item myself. But I'm also still using a wallet I picked up in Florence back in 1997, and it still brings back fond memories — and it's still looking good. (I can't believe it's that old!) And I still get a kick out of the Guinness Stout drinking glass I got in Singapore in 1985 — and I use it all the time. I buy far fewer souvenirs than I used to and I'm much more likely to spend money on unique experiences that create memories than an object. Now when I decide to buy something it has to have significant meaning or [be] something unique I want to use in real life, like a piece of clothing or jewelry. ... I think that's the evolution of every traveller. You find out what things best remind you of your travels forever and what ends up in the garage sale. When Traveling, Do You Bring an Extra Bag for Souvenirs? The San Francisco Pride weekend is coming soon — which inspired me to go looking for rainbow-themed containers and other organizing products. 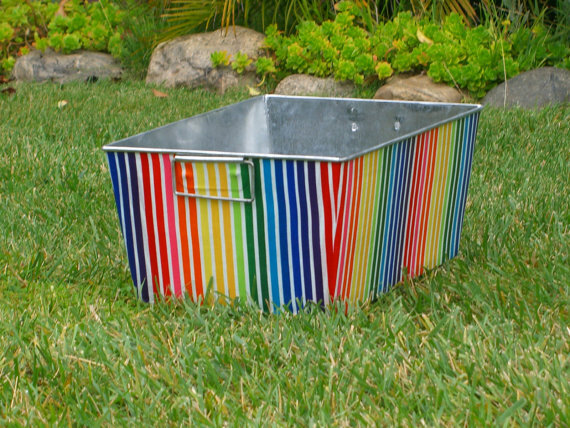 Let's start with this great rainbow stripe galvanized tub. Want something smaller? 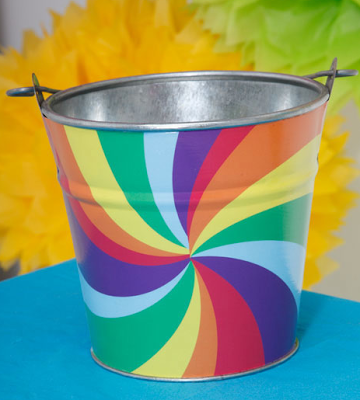 Here's a rainbow swirls bucket. 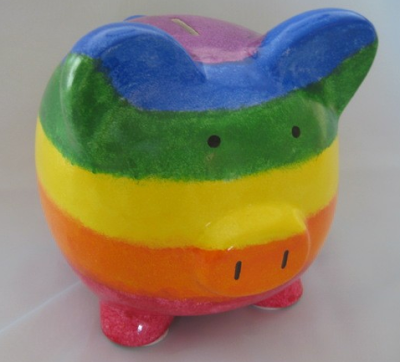 You could get a rainbow piggy bank. 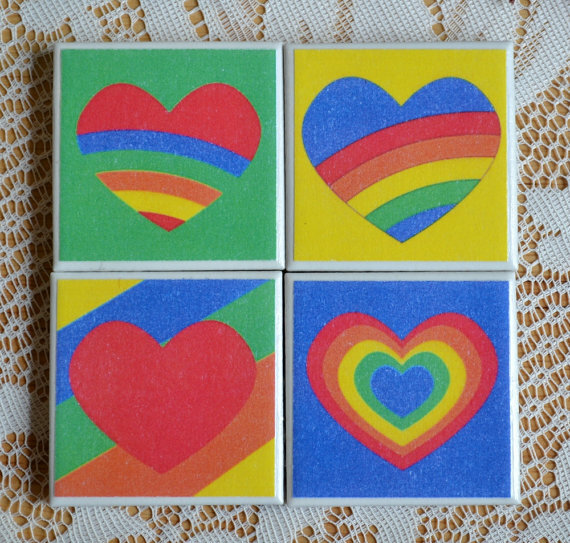 And finally, here's a rainbow heart magnet set for your refrigerator door or your magnet board. Update on June 23, 2014: This magnet set is no longer available. 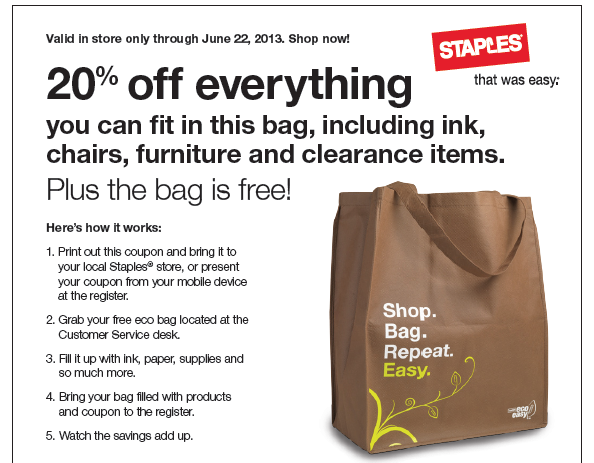 No matter what the Staples ad says, you probably aren't going to fit furniture into this shopping bag — as Consumerist points out. Well, not the furniture you'll find at Staples, at any rate. 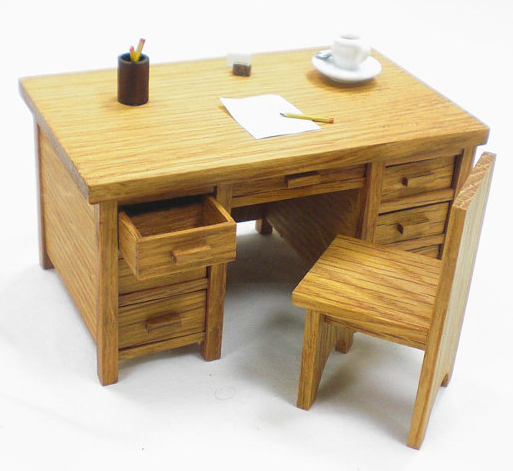 But if you were furnishing a dollhouse, the furniture would fit just fine. There's no reason for dollhouse inhabitants to not be organized, so let's give them some furniture and home accessories to help with that. And since we're looking at an office supplies store, let's start with a miniature file cabinet from ELF Miniatures. A desk with drawers might also be useful. This one comes from Bungalow Miniatures. Now let's move on to furniture for other rooms. 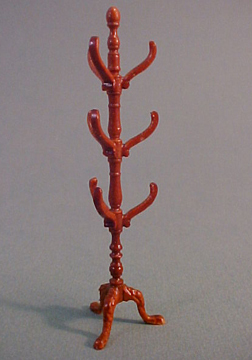 This coat tree comes from Bespaq and is sold by Mountain Miniatures. Update on July 25, 2015: I'm no longer finding this product. Bearly Big Enough has some interesting chests and cupboards, including this blanket chest. You can find them at Nancy's Dollhouses & Miniatures. Update on July 25, 2015: Nancy's website isn't working at the moment, but you can also find some Bearly Big Enough products at Norm's Dollhouse. 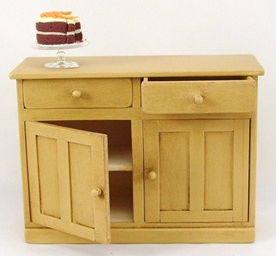 June Wright's work includes a nice selection of storage-related furniture, including this sideboard. You can find her work at Karen Cunningham Miniatures. 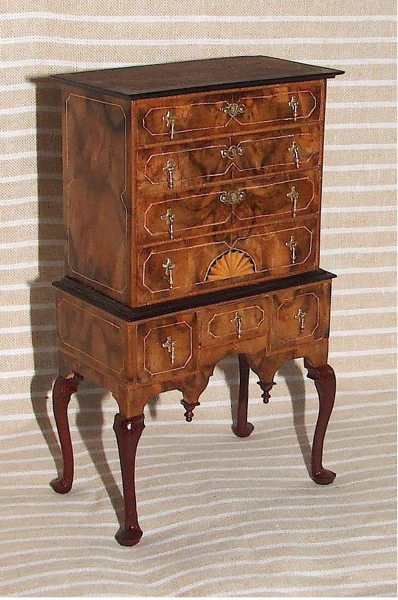 I'm quite taken with this vegetable cabinet by Silvia Cucchi, sold by Swan House Miniatures. And then there's this amazing piece from Chris Malcomson Miniatures; Chris specializes in marquetry. Prices are available on request. Moving beyond the furniture, let's look at some furnishings. Starting in the office again, you can get a set of six manila folders from Dolly's Gallery. At Dale's Dreams, you can find a number of miniature French ribbon boards. 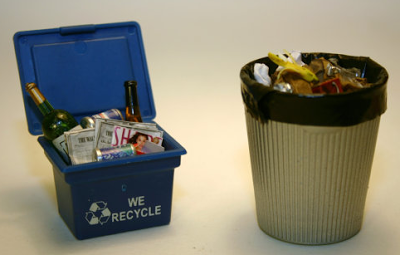 And, of course, as the dollhouse residents declutter, they'll be able to make use of this miniature recycling bin and trash can. Update on July 25, 2015: This product has sold, and it doesn't seem like the store is making them any more. 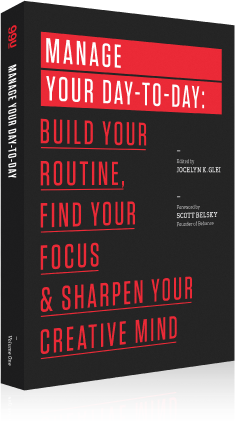 Manage Your Day-to-Day is a collection of essays — not my favorite book format. However, I did find some interesting tidbits in here, and I thought I'd share them with you. A truly effective routine is always personal — a snug fit with your own talent and inclinations. 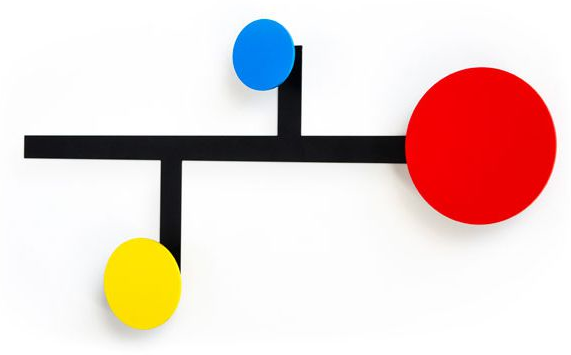 Our bodies follow what are known as ultradian rhythms — ninety-minute periods at the end of which we reach the limits of our capacity to work at the highest level. So if you're feeling the need for some short breaks throughout the day, that could be why. Tony writes more about this in an article called The 90-Minute Solution. If you can, it's best to find a good stopping point on a project — one that frees your mind from nagging questions — before moving on to another task. I'm ... a big believer of curating who you follow on social media. You're letting those people into your brain and they're going to influence your thoughts. ... We need to be really mindful of who we let into our stream of consciousness. Let me point you to some of the most interesting of the 40 gazillion. 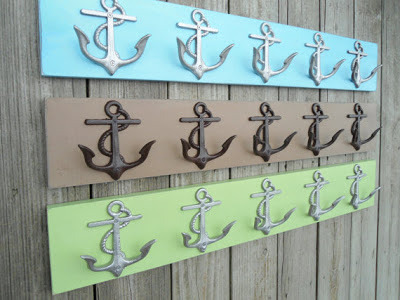 Today I'm going to focus on the racks with multiple hooks or pegs; on another day we'll look at some of the single-hook options. 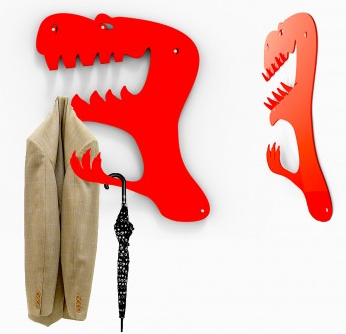 The eye-catching one above is the Piet coat hanger from Presse Citron; you can choose either the Piet 1 or the Piet 3. Unfortunately for those of us in the U.S., the only sites I've found selling this one are in Europe. 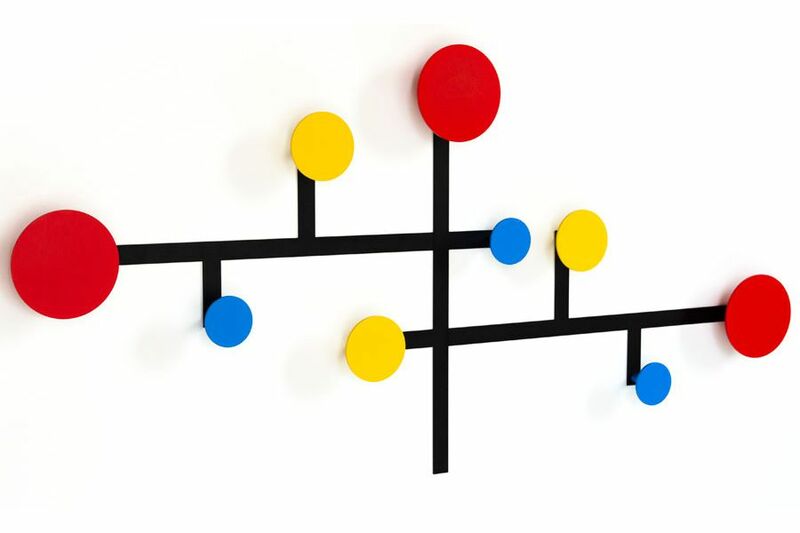 This colorful clothes rack, called Tattakki, also comes from Europe — from Gruppo Sintesi in Italy. But I did find a U.S. seller for this one! It comes in four different colors. 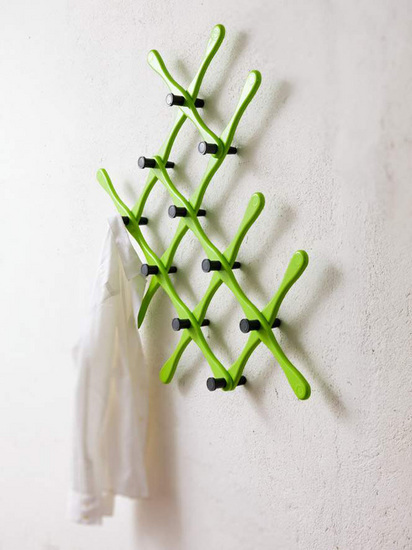 These coat racks each have three hooks, but I chose some close-up photos so you can appreciate the design. These are made from reclaimed wood covered with handmade paper, and coated with several layers of polyurethane. The artist is Meg, her shop is Calyrew, and she's located in Wisconsin. She makes single hooks, too. These anchor wall hooks remind me of my fellow organizer John Trosko, who loves all things nautical. This photo comes from a listing for two 5-hook boards, but there are other listings for single boards. Finally, I have to show you the Mantosaure! I have lots of stuff. I bet you do, too. Sofas, settees, bureaus, bookshelves. 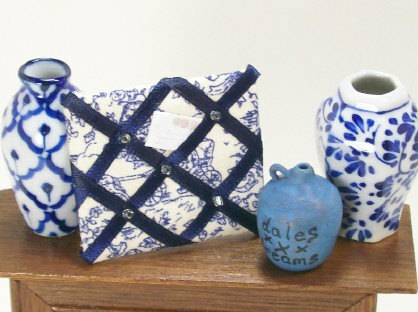 Dishes, bowls, pottery, glass, candlesticks, serving trays, paperweights. Beds, chests, trunks, tables, Windsor chairs, club chairs, ladder-back chairs, folding chairs, wicker chairs. Lot and lots of chairs. And while Quindlen goes on to say she doesn't really feel attached to her stuff any more — except for the Christmas ornaments — she certainly did at some point, and there's no indication she's embarking on a major decluttering effort. But there's also no indication that all her stuff is causing her any stress, or any problems — except for having to dust it, and figure out who inherits what. And this made me think about how often we confuse "cluttered" or "disorganized" with "having lots of stuff." I've worked with people who, when our decluttering and organizing efforts were done, still had about twice as much stuff surrounding them as I would be comfortable with, if it were my home. But it wasn't my home, and they enjoyed all that stuff. Everything had a home and could easily be found when needed. Things that really mattered to them — like their ornament collection, which they cherished as much as Quindlen values hers — were nicely stored to protect them when they weren't in use. Anything that no longer got used, or no longer brought them pleasure to look at, was given away. 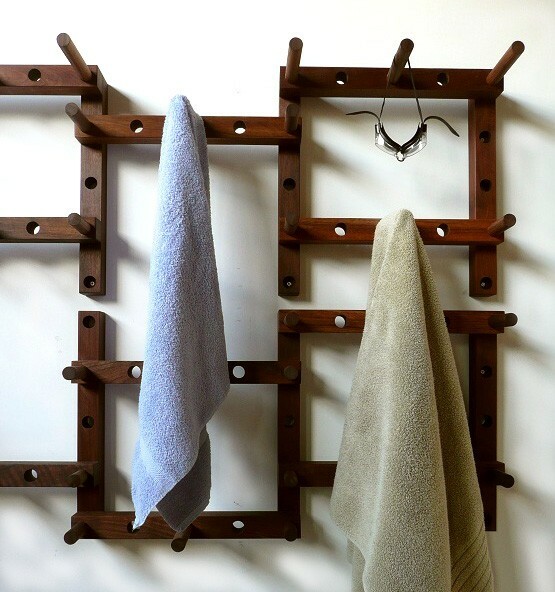 So their home was uncluttered and organized, in a way that suited their personal style. 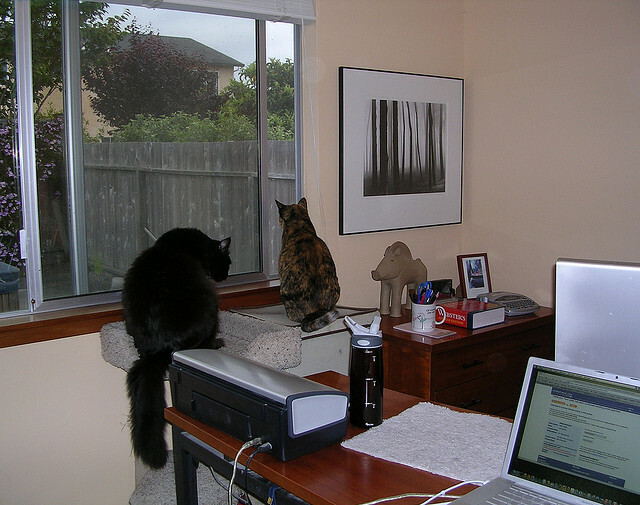 And I'm certainly no minimalist, either, as you can tell from the photos of my home office, one of which I've shown above. I like being surrounded by artwork, and there's a good amount of stuff around for the cats. But that doesn't mean I've got clutter, or that I'm not organized. Uncluttered and organized can look many different ways. Don't worry if your way doesn't look like a magazine photo or a home staged for sale. 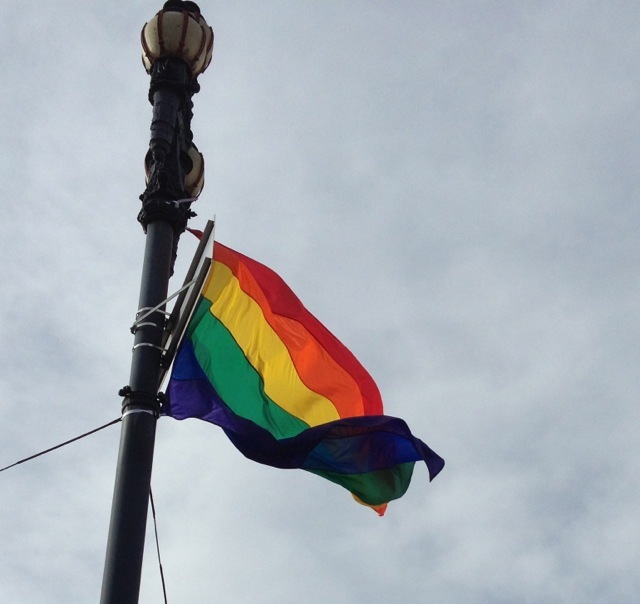 Labels: simplicity and consumerism, What does it mean to get organized? Longtime readers of this blog will know how much I love gorgeous, cute and unusual storage containers. But when it comes to precious family photos, I'm all about keeping them well-preserved. I've sent a similar email about products for organizing photos to three people lately, so I thought it was time to turn the emails into a blog post. So here's my advice about photo organizing products. Online stores that people in the know recommend include Gaylord, Hollinger Metal Edge, Talas, and University Products. 2. For 4x6 photos or smaller, I really like this box from Gaylord, shown above. You can store a lot, safely, in a small space, for not a huge amount of money — especially if you go with the blue-grey version, which looks just fine. University Products has a very similar-looking box. 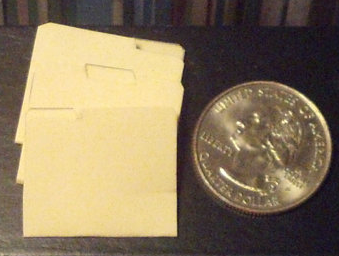 Be sure to get enough envelopes to subdivide things within the box. Gaylord sells box/envelope combinations, and you can always add more envelopes, too, if need be. 3. For larger photos, there are plenty of choices available from the companies I already mentioned, including Gaylord and Hollinger Metal Edge. 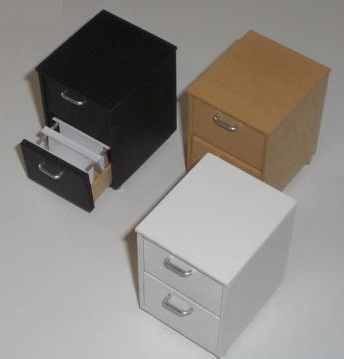 These boxes from University Products, shown above, come in a range of colors. 4. 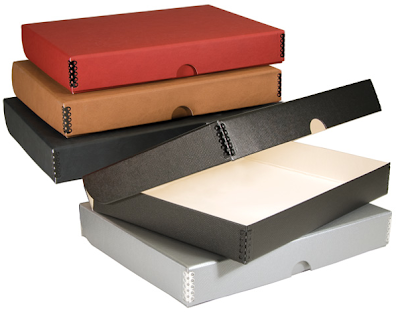 If you want albums, Hollinger Metal Edge has its SafeCare Albums and its SafeCare Economical Storage Albums, along with its SafeGuard Photo/Print Album Pages. University Products has a wide range of polypropylene photo album pages that have all passed the PAT. 5. And there are boxes specifically sized for negatives; for example, Gaylord has this one and this one. 6. Need to get photos out of one of those old magnetic albums? 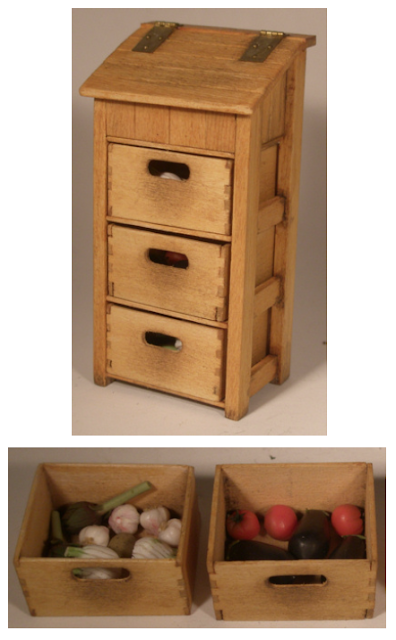 The Practical Archivist sells a Photo Rescue Kit - which also includes her recommended pencils for labeling old photos. And there are numerous other products at the four sites I listed. Some show they passed the PAT, and some don't. 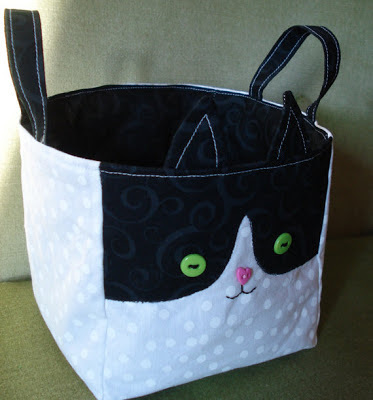 I know a little girl who loves tuxedo cats — so when I saw this storage bucket, I knew I had to write a blog post. The bucket comes from Handmade by KarmaCat; owner Suzanne Schier-Happell mostly makes dolls, but this one piece somehow made it into her store, too. 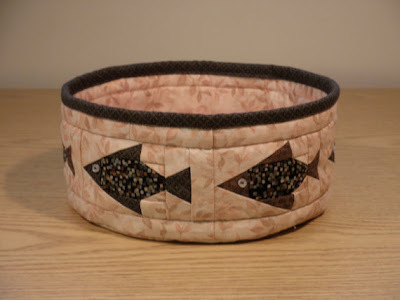 NeedleNook Creations has a variety of fabric storage baskets — I've mentioned the company before — but this is the one that really caught my eye. 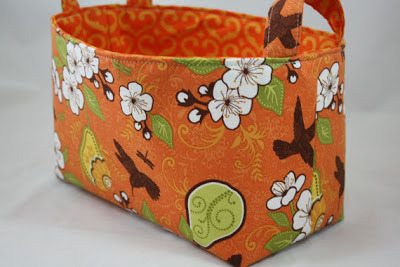 Melissa Santsaver of Diva's Intuition has fabric bins in a range of sizes and patterns. Abode, in the U.K., has this owl storage basket — and a butterfly one, too. 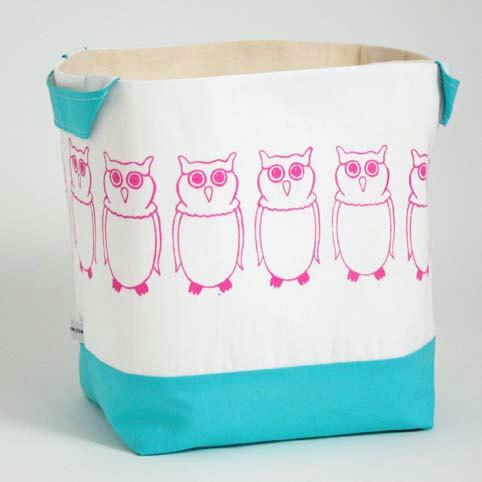 They are "screen printed by the talented Alexia Clare using her original drawings." 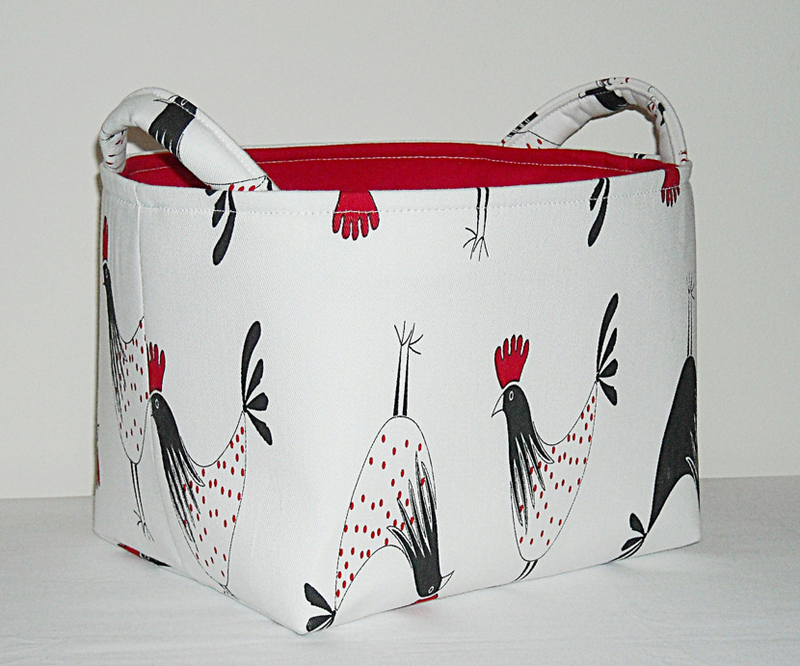 You can see a wider range of storage baskets from Alexia at her Etsy store. And finally, for something quite different, here's one of the many quilted bowls from Cedar Point Designs.